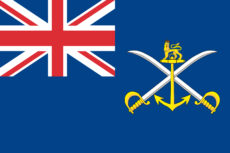 The Army Sailing Association has a Ministry of Defence Warrant allowing us to issue permits to members of the Association to fly the defaced Blue Ensign from their vessels. Members who own their own their own vessels may apply to the ASA office for an Ensign permit subject to compliance with the conditions required by the Warrant. The conditions and an application form are below. Permits are valid for a period of 5 years from issue and do not renew automatically so a renewal form should be used where required. Unfortunately at present applications can only be accepted by the office by post, though payment may be made by card over the telephone.